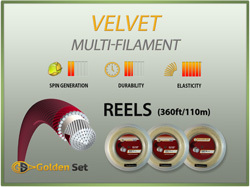 Golden Set supplies a wide variety of high performance tennis strings - all at unbeatable prices. Within our line of tennis string, there is sure to be one that is ideal for your game. 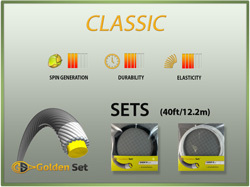 Polyester tennis racquet string has become the most popular string type in recent years. From recreational players all the way up to the professional ranks, it is the most favoured string type. 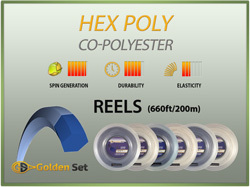 Its performance properties, particularly polyester's unmatched spin production, are responsible for its prevalence. 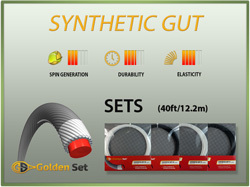 Synthetic gut racquet string, of which Golden Set provides two different types, offers tremendous value and good all around performance. 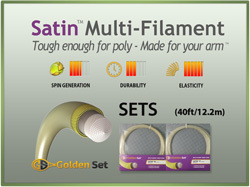 The high elasticity of multi-filament tennis string provides outstanding comfort and response. 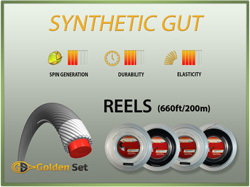 Synthetic gut and multi-filament strings can be used by themselves or commonly as part of a hybrid setup with a polyester string. 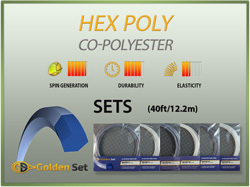 Combining either of these string types with polyester will produce a string-bed that is noticeably softer than using polyester alone. 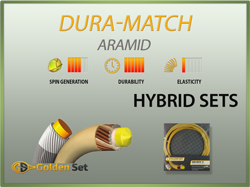 Aramid / Kevlar® tennis strings offer the ultimate in durability but with a feel that is unfortunately too stiff for most players. Polyester strings, with their spin advantage, higher elasticity and all but equal durability, have generally taken the place of aramids. 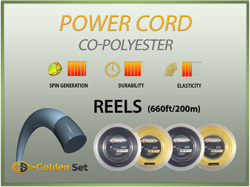 Reels typically contain hundreds of feet of string (enough to restring several rackets). Whereas sets usually contain about 38 to 40 feet of string (enough to restring a single racquet). 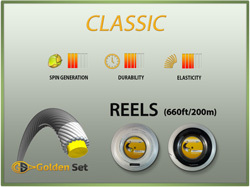 Generally, a 660 ft reel will string approximately 18 racquets. On a per unit length basis, it costs less to package, transport and handle reels versus sets. 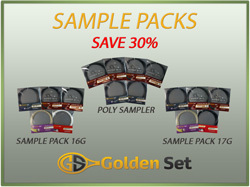 Golden Set passes these savings on to you: for a given string type, the per unit length cost is less for reels than sets. Q. 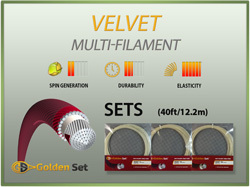 You string racquets for other people, why should you buy Golden Set tennis string? 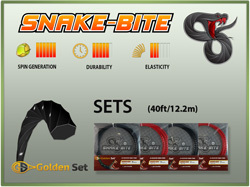 While the guaranteed quality will keep your customers happy, the low cost of Golden Set products will keep you happy. Gaining and retaining clients is easier when you can offer premium products at competitive prices. Q. 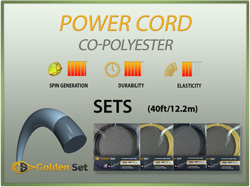 You string your own racquets, why should you buy Golden Set tennis string? 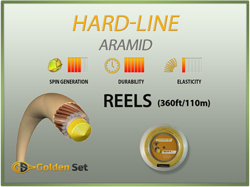 The answer is simple; the quality of Golden Set string is second to none and at a significantly lower cost than our competitors. How is this possible? 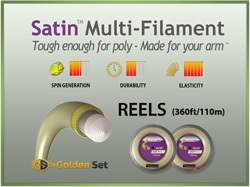 Firstly, with Golden Set string, you are buying directly from the brand - no middle person. 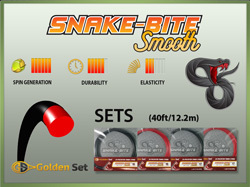 Secondly, Golden Set does not engage in expensive marketing practices - the savings are passed on to you. Unless you actually like paying for inefficient distribution channels, expensive advertising and massive sponsorship schemes, acquiring your tennis string from Golden Set is a no-brainer. Q. You do not string racquets, why would you buy tennis string? Even if you do not string racquets, if you play tennis on a regular basis you should definitely consider buying your own tennis string. As you likely already know, stringers are happy to supply the tennis string to be installed in your racquet. You are limited to the selection of racquet string they carry and, unless they carry Golden Set string, you'll be paying a premium for it. Alternatively, stringers are also happy to string your racquet with tennis string that you provide. Of course, in this case, they will only charge you for labour which is usually between 15 and 20 dollars. By supplying your own string, you are assured your preferred string type and your total stringing cost will be reduced. Q. Does tennis string go bad? How long does it last for? If stored under the correct conditions (not in direct sunlight or excessive heat), all Golden Set strings will remain 'good as new' for several years. 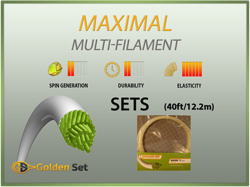 As well, we ensure that all of our inventory gets turned over within months of manufacture, so you can be assured you are always receiving 'fresh' tennis string from Golden Set. "This is great stuff and holds up well. We use it to string so many rackets for people and they really like the brands. The snake bite is the best if you use big banger "